It’s November 3rd, 8:30 in the morning, a beautiful clear morning and I’m calling you from the airstrip at Lukla. 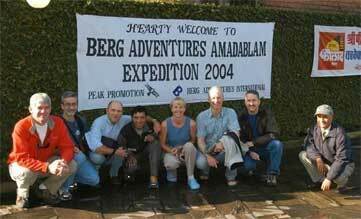 The 2004 Berg Adventures Ama Dablam expedition is underway. 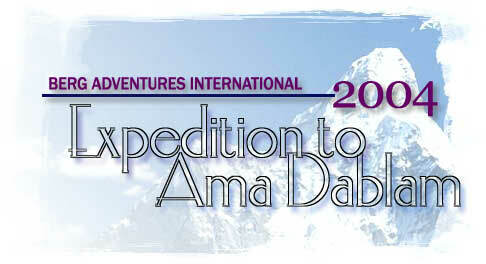 Joe, Don, Jeff, Jennifer, Grant and I along with Ang Temba, Min and Nima Tashi flew early this morning from Kathmandu . It was probably the most beautiful flight out of the Kathmandu valley and over to Lukla that I have ever taken. It was absolutely clear, the Himalaya in every direction was shining and bright, glaciers and snow peaks gleaming and of course the beautiful valleys of the middle hills in Nepal along the way were fascinating as the plane flew low over ridge tops and we saw close into villages and the rushing rivers below. It was an absolutely beautiful day for a flight to Lukla. The group all did our normal city tour with Krishna Dhakel yesterday in Kathmandu , but the excitement of the climb and the adventures trekking in the Khumbu ahead of course is on everyone’s mind. 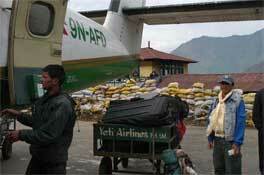 It is very rewarding to have our feet on the ground up here in Lukla and be underway. We’ll report to you along the way, normally at our camp, actually we are at a lodge tonight along the Dudh Koshi river. Normally there we don’t have satellite coverage but certainly by tomorrow afternoon when we reach Namche we will be back in contact and we look forward to keeping you updated on our adventures as we acclimatize and get reacquainted with old friends in the Khumbu on the way to our climbs of Lobuche Peak and Ama Dablam.